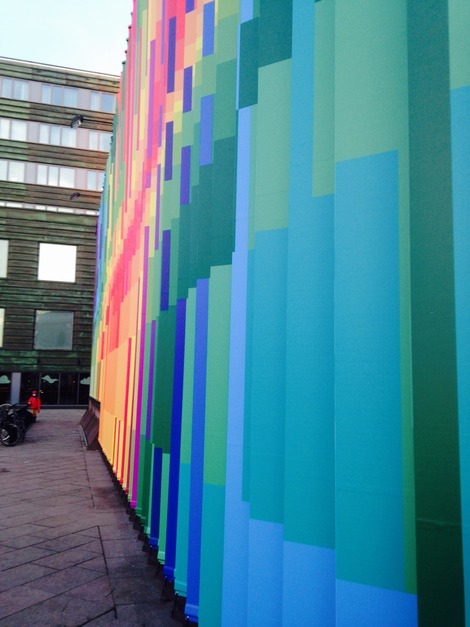 Marisa Ferreira plays with colour and perception in her artwork for the façade of Oslo S. "Rear Window" comprises 59 vertical stripes. The stripes are mounted at a 45 degree angle to the façade in plan. The artwork is kinetic and appeals to the senses. New patterns are created at every moment of perception. The artist explores the role of the observer in the creative process and demonstrates that they are not passive. Ferreira has created colorful sequences in the stripes based on simple geometric shapes drawn according to the Fibonacci numerical sequence. The composition echoes the rhythm of the footsteps of people crossing the square. The artwork is not a simple and navigable visual field to the eyes, but gradually appeals to the senses and to the physical presence of the viewer in space. 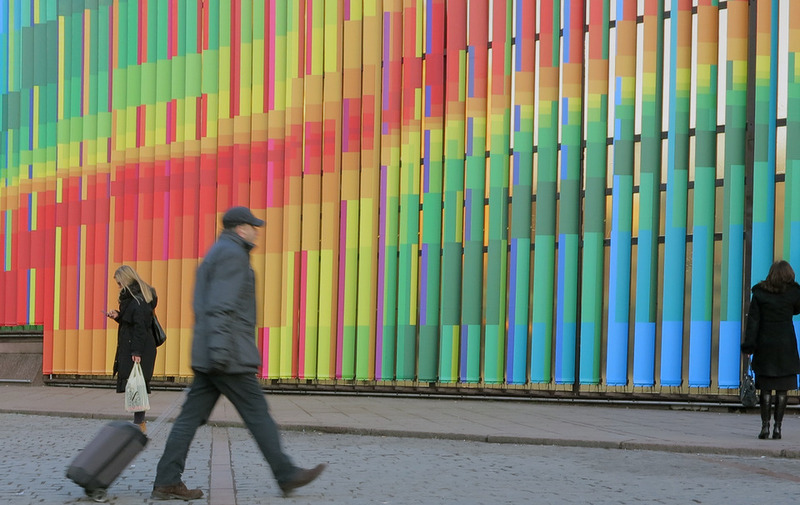 Its isolated and flat colours are also a way to explore, measure and build the space; they invite to a kinetic experience, giving new patterns at each moment of perception. The title of the artwork “Rear window” is inspired by Alfred Hitchcock film dated from 1954 with the same name, which explore the role of the viewer in the creative process, when showing that the spectators are not passive recipients, who merely accumulate images of the film, but engage in an important cognitive and affective activity in the course of attempting to understand the story (theory of perception, gestalt). When walking from the left, the golden foil in the back acts as a mirror of the city and plays a unique role in the artwork. A specie of metaphor for both image and the individual's own selves. The mirrored surface change the viewer's traditional position as outsider, and make him/ her aware of his/ her participation and role in the making and meaning of the artwork. The right side of the piece explore how the body responds to colour and architectural spaces and expresses a move away from the artwork as representation, as an image of something other than itself. Based on simple, geometric shapes drawn after Fibonacci numerical sequence, the composition expresses the walking patterns, the rhythm of footsteps and its progression through space. Thus, it emphasizes “walking through” the art itself and not just “looking at it”.